The Tiffen 95mm Coarse Thread HDTV/FX 5 Filter is a gentle softening and diffusion filter specifically designed for use with high definition imaging. This filter helps to lessen the hyper sharpness that is commonly associated with HD photography and produce an image quality that is more akin to film photography. By reducing contrast and sharpness slightly, skin details appear smoother and there is an increase in shadow detail. The effects of this filter are most significant when used for video applications as opposed to still photography. This filter provides more softening than the 4 density. 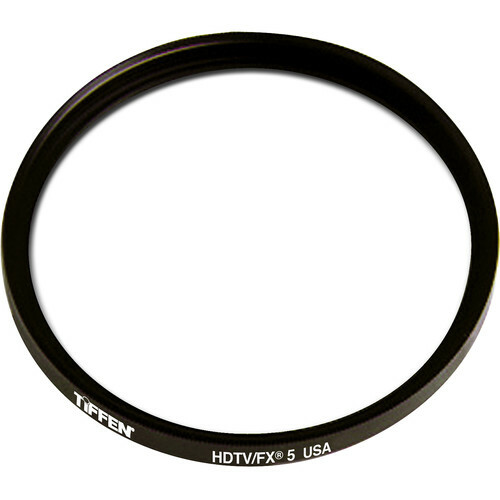 This filter is constructed from Water White glass and is made using ColorCore technology, a process that involves laminating the filter substrate between 2 pieces of optical glass, grinding flat to a tolerance of 1/10,000th of an inch, and then mounting to precision metal rings. Specifically designed for use with HD cameras for creating a more film-like look. Lessens hyper sharpness and contrast while smoothing skin details and providing greater shadow detail. Effect is most noticeable when used with video applications as opposed to still photography.